← Freedom of speech is NOT a lisence to abuse – It is a responsibility! I wrote about J C Penny last week. A stock that is continuing to decline on Monday. Many retailers are struggling, but not all. Kohls is a much different story. Kohls is doing it much better than most of its competitors. The stock is doubled from $35 in May last year to $78 on Monday. Up 3,15 percent before their earning report on Tuesday. They simply beat their competitors on e-commerce, store productivity, ROIC and revenue which is pretty impressive. Many of Kohls competitors are closing down stores, but Kohls are going in the opposite direction by opening up stores. Sales revenue increased over 6 percent in their fourth-quarter report. Diluted earnings per share came in at $5,12 in the same period. 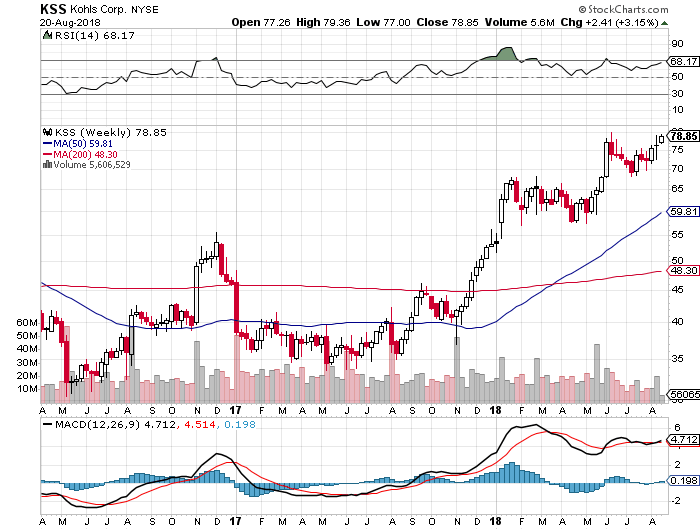 ROIC is between 10 – 20 percent for a healthy store, while Kohls is near 10 percent, and they are keeping up their momentum. Both, J C Penny and Macys reported bad reports last week, but also here, Kohl`s are reporting positive revenue growth. Kohls opened up its fifth e-commerce fulfillment center last year, and they have an estimated 37 million views a month to their websites. The company is also collaborating with Amazon were people can return products to Kohls. Kohls private brands, which include Sonoma, Croft &amp; Barrow, and Apt 9 generate nearly half of the firms $19 billion in annual sales. They also has plans to re-launch and reimagine the billion-dollar Sonoma brand for apparel and home goods. Other brands are Jennifer Lopez and Marc Anthony. Two artist with great success on the stage. Kohl`s uses a «racetrack» aisle that circles the entire store, a technique borrowed from discount stores. In 2011, they announced plans to remodel 100 of its 1,100 locations. Changes included redone store sections, fitting room, and newer merchandise displays. In 2015, Kohls opened a test store built around selling only returned, yet as new clothing, home goods, jewelry, and accessories. The store, called OFF/AISLE by Kohls, sells items at a marked down price. The stores have a restrictive return policy different from regular Kohl`s stores. Kolhl`s Corporation is expected to report earnings on August 21, 2018 before market open. The report will be for the fiscal quarter ending in July 2018. Earnings in April was a 30 percent surprise with an EPS of 0,64. The consensus EPS for the quarter this time is $1,66. The weekly chart is positive and positive news can push the stock to a new all-time high.